Learn how to select 2011 Census small area data and create printable thematic maps for Bradford. One of the easiest ways to explore the 2011 Census results is mapping small areas, making use of free online tools. Let’s say you want to visualise Ethnic Groups in Bradford by creating a map of where people reside. 2011 Census data is hosted by Nomis and can be accessed by clicking here. 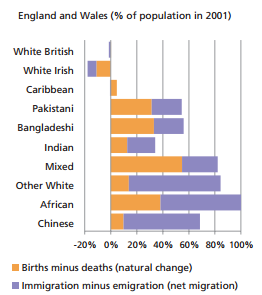 With the 2011 Census data front page open, choose Key Statistics followed by the KS201EW Ethnic Group table. Table information is provided, with a link to a full description. You want to Explore the data, so click on the Wizard Query. You now have a 5-step process to complete, starting with geography selection. STEP 1 The small area you will use is Lower layer Super Output Areas. Select ‘some’ from the drop-down box then find Bradford from the next drop-down and click ‘tick all’, then Next. STEP 2 is selecting ethnic groups. Uncheck ‘All usual residents’ and check only broad ethnic groups, then click Next. STEP 3 is percent selection, which can be skipped. Click Next. STEP 4 is choosing the format. Check ‘Map’ and click Finish. STEP 5 is the download. Click ‘View map’ which opens a new window. Here you can select which Ethnic Group to visualise and customise your map size or include a background (as above), with a printable version if needed. We have produced a thematic map of Bradford for the preliminary 2011 England and Wales Output Area Classification. The Output Area Classification (OAC) distills key results from the Census for the whole of the UK to indicate the character of local areas. It profiles populations, structures other data, and helps target resources. To open the preliminary results map please click here. Pen Portraits for these ‘supergroups’ are available here. An on-line index of topics and tables is now available via the ONS website. This has been designed to help users to locate the information they are looking for. Whether you know the table number you are looking for or just want to search by topic, this tool will provide information as to which website the tables are resident and to what geographies the data is available for. Available for use on Excel 2007 and above, this tool will be updated as further tables are released. You can download this tool by clicking here.